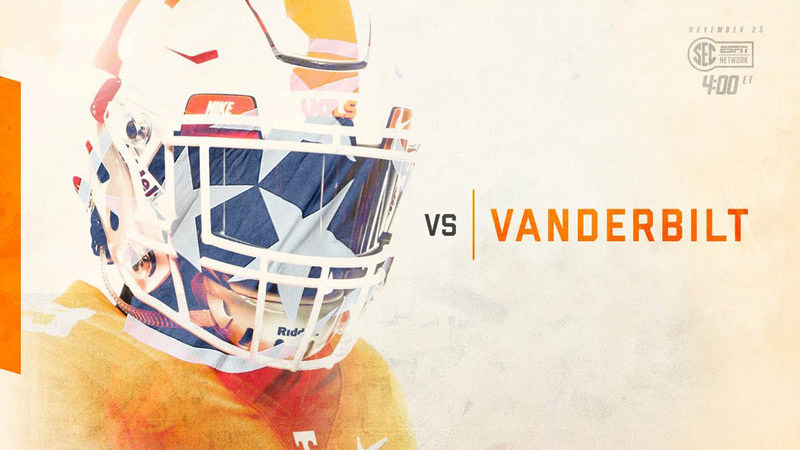 Knoxville, TN – Tennessee will close out its 2017 regular season schedule against SEC in-state rival Vanderbilt on Saturday at Neyland Stadium. The game will feature a 3:00pm CT kickoff on SEC Network. Dave Neal (play-by-play) and Matt Stinchcomb (analyst) will be in the booth and Dawn Davenport will report from the sidelines. Vol Network radio affiliates will have a live audio broadcast with Bob Kesling, Tim Priest, Brent Hubbs and Maddy Glab. Sirius Channel 157 and XM Channel 192 will also carry a live audio broadcast. Tennessee (4-7, 0-7 SEC) is coming off a 30-10 home loss to LSU on November 18th. Redshirt freshman quarterback Jarrett Guarantano completed 13 of 23 passes for 239 yards and one touchdown but the Tigers’ dominance in the running game (LSU’s 200 yards to UT’s 38) proved to be too much. Last week, Vanderbilt (4-7, 0-7 SEC) suffered a 45-17 home loss to Missouri. Junior quarterback Kyle Shurmur went 28-for-53 for 348 yards, one touchdown and three interceptions in the loss. Tennessee will celebrate Senior Day on Saturday as 22 seniors with make their final appearance at Neyland Stadium. This year’s senior class has combined for 29 wins over the past four seasons. The 2017 seniors led UT to three-consecutive bowl victories, marking the first time in Tennessee program history that had happened. Fans should arrive early to catch the Senior Day ceremony on the field as each senior will hear his name called as he runs through the T for one final time. The Senior Day ceremony will start at approximately 3:53 p.m. ET. This year’s game marks the 111th all-time meeting between Tennessee and Vanderbilt. UT is 75-30-5 all-time against Vanderbilt and the Vols have won two of the last three matchups. Tennessee is 38-10-1 against the Commodores when the game is played in Knoxville. UT has won 31 of its last 35 games against Vanderbilt, including a 22-game winning streak in the series from 1983-2004. In 2016, Vanderbilt took a 45-34 win in Nashville. Last season’s matchup was an offensive showcase as Vanderbilt tallied 608 yards of total offense and Tennessee had 516. UT’s John Kelly carried the ball nine times for 52 yards and Ethan Wolf caught four passes for 33 yards. Shurmer went 21-for-34 for 416 yards with two touchdowns and one interception and Ralph Webb rushed for 114 yards and two touchdowns on 21 carries.